A steaming bowl of Jewish comfort, no chicken necessary. Let’s face it: There’s just something wonderfully soothing about seeing a steaming bowl of matzah ball soup with its pillowy-plump dumplings swimming in a bath of golden broth. 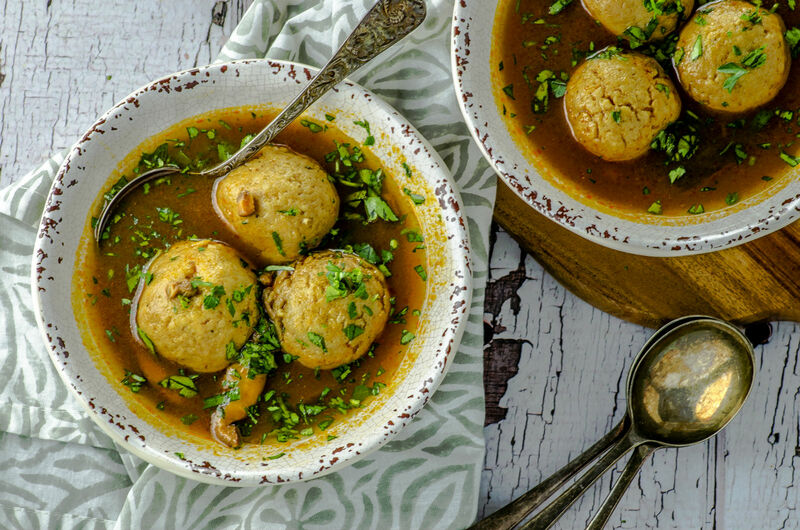 This healing vegetarian matzah ball soup delivers all the “ah” of its traditional cousin with precisely the right amount of goodness (and good-for-you-ness) thanks to a clever use of shiitake mushrooms, tomato paste, and a pot full of seasonal vegetables. 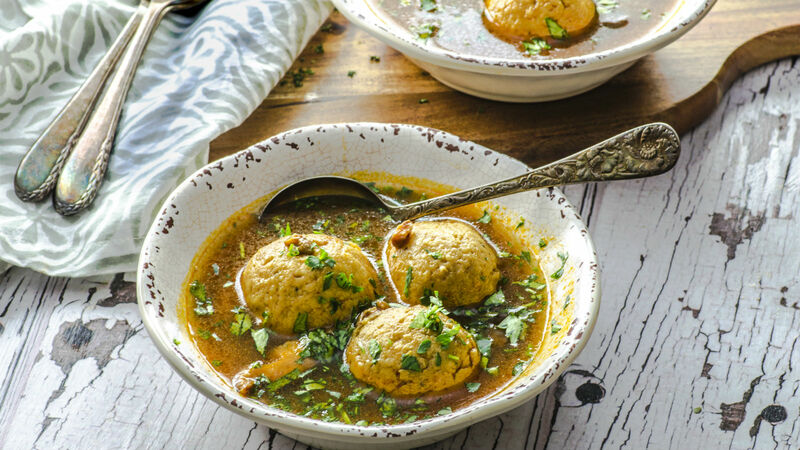 Whether you add our healthy matzah ball soup to your Friday night dinner routine or prepare a large pot for lazy Sunday afternoons for the family, this soup is certain to satisfy the stomach and soul. 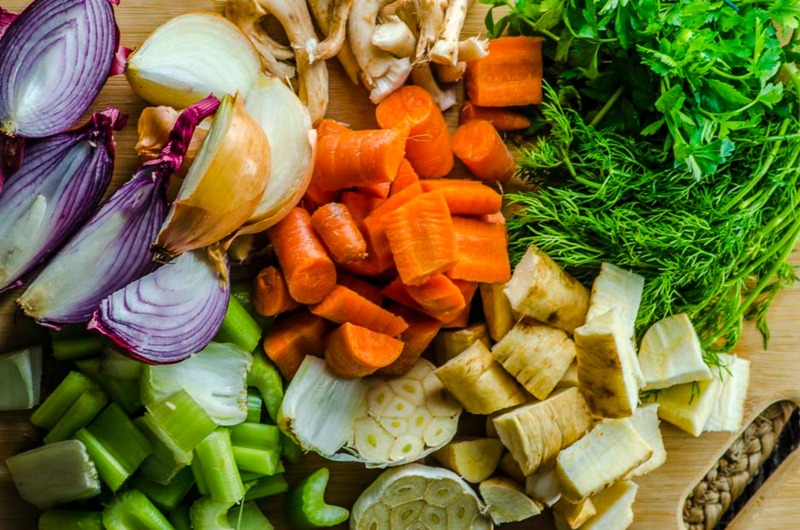 When we first considered a vegetarian alternative to chicken soup we knew that we didn’t want to use bouillon cubes, powders or vegetable broth. The question was, how could we create a deep, rich taste that would satisfy our family? The first thing we did was caramelize some tomato paste with olive oil in order to enhance the flavors of the tomatoes and oil; then we added fresh shiitake mushrooms tops for their chicken-like texture and rich almost-smoky flavor. 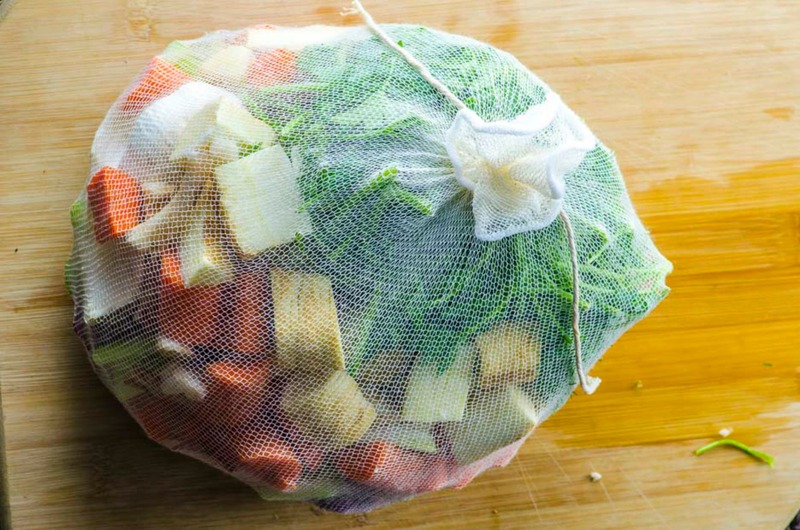 Additional depth came from a cheesecloth bag filled with delicious ingredients — red and yellow onions (skins still on to create a rich-colored broth), carrot, parsnip and celery, dill, parsley and a whole head of garlic. We also cooked the matzah balls in the vegetable broth instead of cooking them separately, so they could absorb the flavor of the broth. The result was a rich, deep-flavored broth where the chicken was not missed! This soup is easy to make and can be dressed up or down. Try serving it in an elegant china bowl with a steamed bundle of julienned carrots, zucchin, and yellow squash for a sophisticated first course to a formal dinner. You can also cut plenty of root vegetables (sweet potato, turnips, butternut squash) into a large dice and cook together in the soup for a delicious more rustic soup. Add the tomato paste and cook for 2 minutes over medium high heat, stirring constantly. Add the sliced shiitake mushroom caps, stir well and cook for another minute. Add 10 cups water, salt, turmeric and pepper (don’t add all the salt at once here, you can adjust to taste later). Place the shiitake stems, carrots, parsnip, onions, celery, garlic, dill, and parsley in a cheese cloth. Tie it well with kitchen twine and place it in the soup pot. Bring to a boil and let it cook for 5 minutes. Cover, reduce heat to medium low and simmer for an hour. The broth should be ready and should be flavorful. If it’s not, continue cooking for another 15-20 minutes. While soup cooks, prepare the matzah balls following the package instructions. Remove cheesecloth from the soup and place it in a colander with a bowl underneath. Squeeze as much liquid as you can from the cheesecloth and pour it into the soup pot (the liquid will be hot, so use a wooden spoon or another utensil). Discard vegetables. Prepare matzah ball according to directions on the box, and chill in fridge for 30 minutes. Or, you can make a homemade version like this. Place the matzah balls directly into the broth and cook, covered, for 20 minutes. Chicken soup is universal, comforting and enjoyed year-round.